I’m just going to lay it all out there. 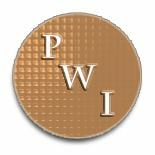 The reason I haven’t written a post on this place is that I just didn’t want others to find out about it. I know, I’m a jerk. But look, this place is a hidden treasure in Nashville. 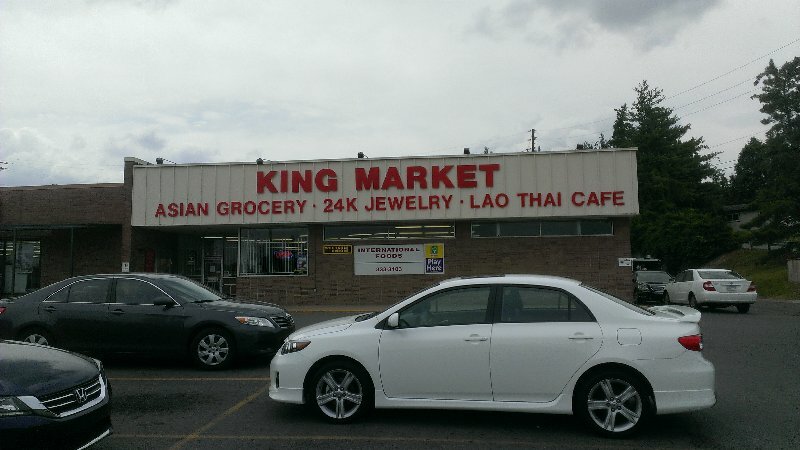 Nowhere else in town can you find a place that sates your Asian grocery, jewelry and Lao food needs UNDER ONE ROOF! That’s right folks, King Market DOES IT ALL! I had seen this place pop up in my feed a few times, and especially because of the recommendation of some trusted friends on Yelp, but I had never actually made the trip down there. Then one day I was down that way visiting So Gong Dong Tofu House, only to find out it was sadly closed that day (on a Wednesday?!?). Did a quick search and found out that King Market was right down the road! 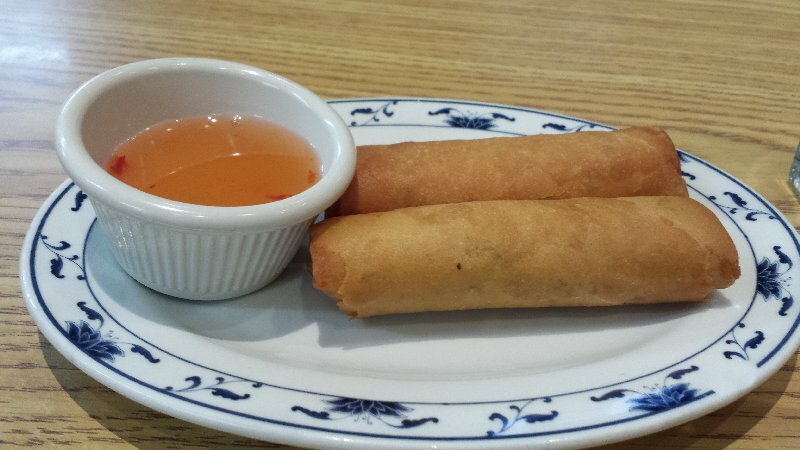 Don’t go egg roll – SPRING ROLL (these are not spring rolls)! It’s really a cool place. You walk in, see the Asian market part and off to the right is a full jewelry store – like a mini slightly budget Jared Galleria in there. And right around the corner from there? A nook with a bunch of tables and TVs. As soon as I got there, pretty much every table was packed, but the lady who runs the show, Nina, got me seated right away. I’d say Nina is one of the great parts about going to this place. She banters in multiple languages with the regulars, she will remember who you are pretty quickly, she can guide you through the menu very well, and she will help you find new foods based on your previous experiences there. And she is just a sweetheart. I’d give her a job in a heartbeat. So, no reason to be afraid there – Nina’s got your back. The first thing I got there was the Khao Soi with some spring rolls on the side. The spring rolls were filled with fresh veggies and a nice soft uncooked wrapper with a yummy dipping sauce. And the Khao Soi… oh that soup…. 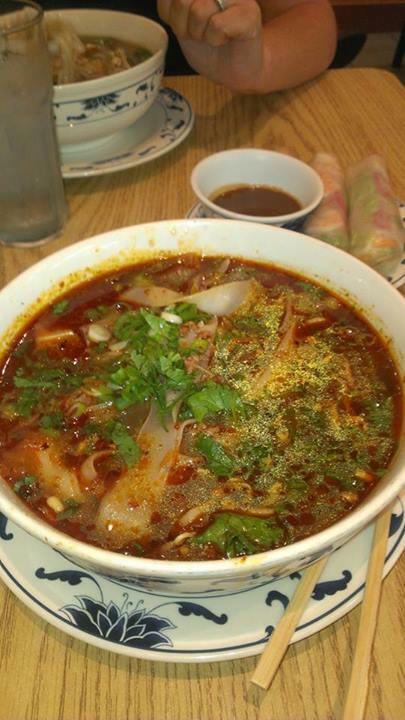 It was a glorious bowl full of veggies, meat, and rich rich broth. And when I asked for it extra hot, they gave it to me extra hot! A nice film of hot oil floated at the top and made every bite that much more magical. It was really one of those moments where by the end, I was ready to lick the bottom of the bowl – no shame. Oh and the sticky rice – so perfect in texture. I got the beef larb once, such a cool melange of flavors that I just didn’t care about what beef parts they were. And one day when I was going to repeat an item and Nina steered me to the Chicken Noodle Soup (again, extra spicy to my specifications) and I am convinced that brew could fix anything that is ailing you. Crap. Now I can’t stop thinking about that soup. I really need to come up with some new reason to get down there. And when I was coming down with something before a trip to Israel this winter, Nina sent me home with an extra batch with fresh noodles I could cook myself and I swear I was fine by the time I landed at Ben Gurion. This place is vegetarian/vegan-friendly too; my wife has enjoyed the heck out of it so far. So, as much as I want to keep this joint to myself, I have to share it with the rest of the world. Or install a soup pipeline from Antioch to my part of town. Or both. Do they have Korean grocery items? 🙂 I have not yet ventured out to find a good grocery to get my Korean fix. 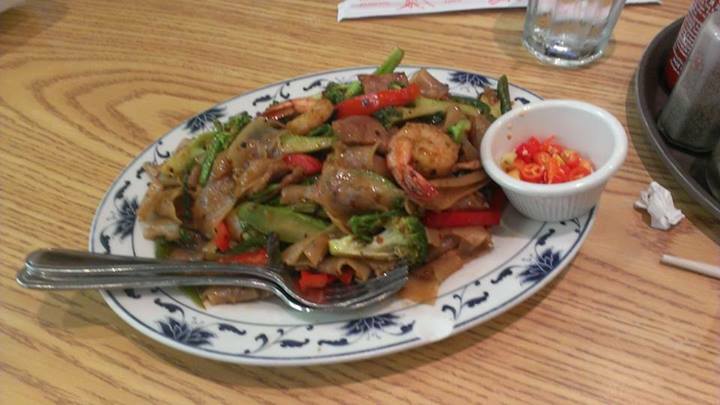 Have you tried the papaya salad yet? Ask for it 5 out of 5. It might have been the hottest thing I have ever ingested. 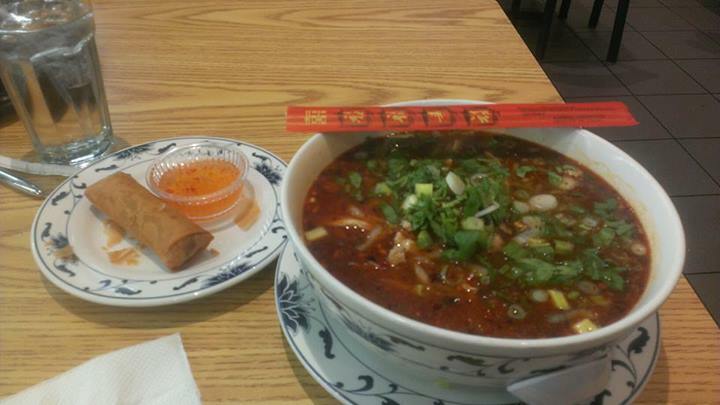 This entry was posted on January 29, 2014 by Sparky in Where Are We Eating? 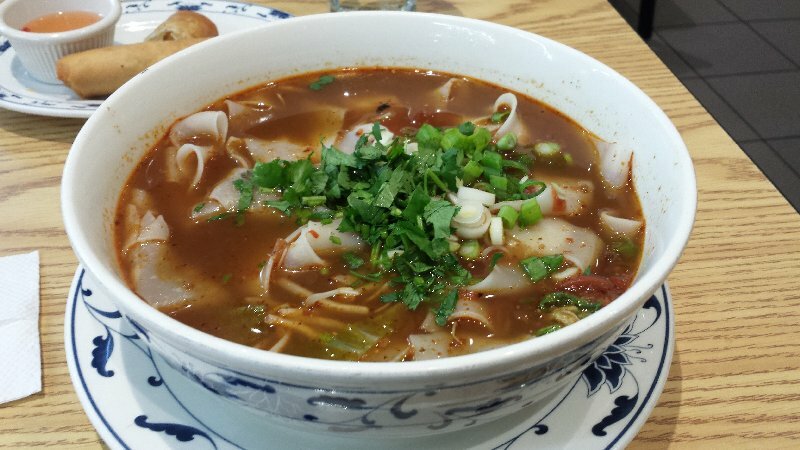 and tagged Antioch, chicken soup, jewelry, khao soi, King Market, Lao food, thai food.